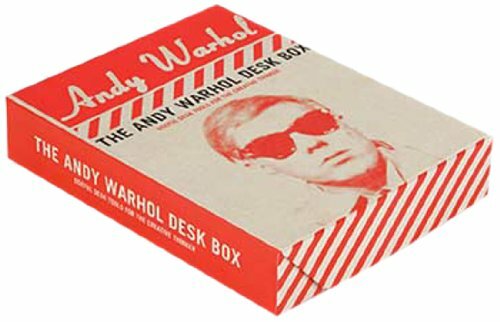 Exclusively designed for Andy Warhol collectors and fans, this deluxe desk set includes useful tools for creative thinkers. Each piece celebrates Warhol's iconic style: a lined journal with quotes and artwork, a memo pad that echoes the patterns of Warhol's silkscreened boxes, a Campbell's can pencil sharpener, stickers, banana-shaped bookmark, a 15-minutes of fame sand timer, six-inch ruler, and cow head eraser. The set even includes a never-before seen self-copy photocopy from Andy, published exclusively by Galison in collaboration with the Andy Warhol Foundation for the Visual Arts., All is contained within a sturdy, re-usable box, making this a must-have for any Warhol fan.